If you're looking for a from-scratch pancake batter, here's one that we really like. On a greased griddle over medium-high heat, prepare 12 to 14 small pancakes. Start by dolloping batter from a tablespoon to create a pancake about 1-inch in diameter. Gradually increase the size of each pancake until your final pancake (the face) is about 4-inches in diameter. You'll probably want to switch to a small measuring cup to dollop the batter for the last 4 or 5 pancakes. As with all pancakes, cook the undersides until the tops are covered with bubbles. Flip and cook the other sides to a golden brown. You'll likely have to work in two batches, so transfer any finished pancakes to an oven preheated to 225 degrees. 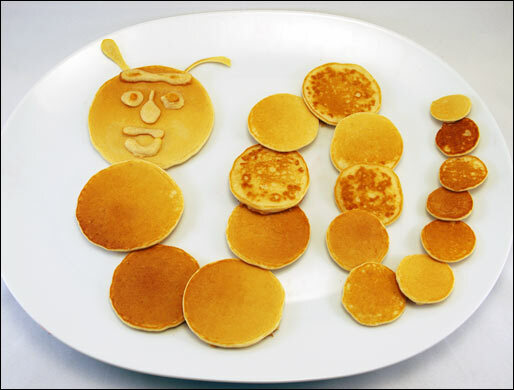 Once all the pancakes are ready, arrange them on a large plate in a caterpillar formation. 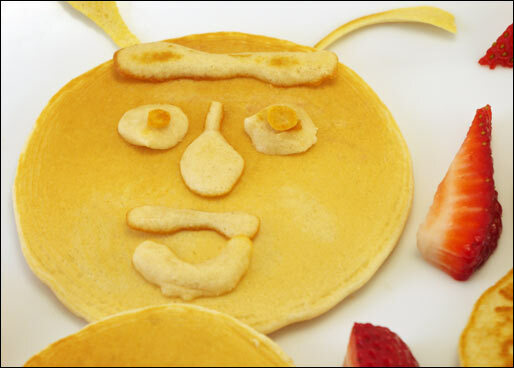 Start with the largest pancake (the face) and slightly overlap subsequent pancakes to form the body. Makes 2 pancake caterpillars. Serves 4 to 6. In the picture directly above, you can see how to make a pancake caterpillar with only pancake batter - no other ingredients necessary. The trick to making pancake pieces for the face is to drizzle and drop batter randomly on the griddle using a small spoon. Flip all the random pieces at once. Among the pieces, find shapes to make a face. If you've ever made a pancake and if you know the basic concept of Mr. 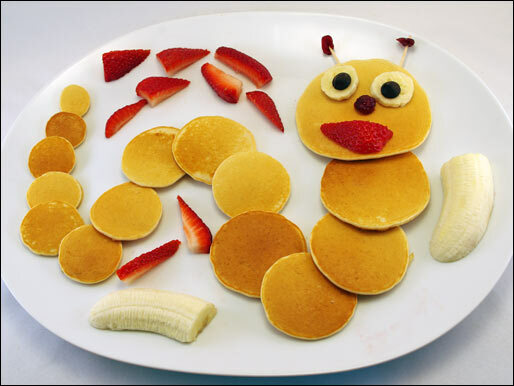 Potato Head, you can make a pancake caterpillar. Have fun! Bugs for breakfast? Only if it's this giant, friendly pancake caterpillar. What's better than a pancake? 12 pancakes! Recipe number 3028. Submitted 6/2/2011.